President Donald Trump inserted himself personally into his administration’s discussion of the fate of the FBI headquarters in downtown Washington near his D.C. hotel, House Democrats said in a letter released Tuesday, raising questions about possible conflicts-of-interest between the government’s actions and the president’s personal business holdings. “These new documents also show that top GSA officials promised to ‘hold our ground’ on this proposal ‘per the President’s instructions’,” they wrote in the letter to General Services Administration head Emily Murphy. The White House denied claims that President Trump attempted to influence the real estate decisions about the FBI headquarter building. “The idea that the reason the president wanted the F.B.I. headquarters to remain in its current location is based on anything other than the recommendation of the F.B.I. is simply false,” said Lindsay Walters, a White House spokeswoman, in a statement to ABC News. The internal documents obtained by the Oversight Committee are quoted at length in an Oct. 18 letter from congressional Democrats to Murphy, shared with ABC News Thursday. The disclosures come on the heels of new reports from the agency’s inspector general, and a report Thursday in the New York Times, which raise questions about President Trump’s decision to intervene personally in the real estate discussions surrounding the iconic Pennsylvania Avenue property. A sign stands outside the Federal Bureau of Investigation (FBI) headquarters in Washington, D.C., Feb. 2, 2018. In August, the GSA inspector general, an internal independent watchdog, concluded that Murphy initially misled Congress about Trump’s interest in the project, writing that she provided “incomplete” testimony about conversations with the president and White House officials about the FBI headquarters project. Asked twice about the White House’s role by Rep. Mike Quigley, D-Ill, Murphy said the directions to redevelop the downtown headquarters came from the FBI. Murphy’s testimony “was incomplete and may have left the misleading impression that she had no discussions with the President or senior White House officials in the decision-making process about the project,” the inspector general concluded. Internal email correspondence between the General Services Administration and the White House showed President Trump was being briefed on discussions about the FBI building, and direction on the project was clearly coming from the White House, congressional Democrats said. “GSA is going to hold our ground … per the President’s instructions,” one email from Murphy’s chief of staff read, according to their letter. At stake was a plan to move the FBI headquarters out of the city – a relocation that had been in the works for several years and narrowed down to three possible sites in Maryland and Virginia in 2013. The watchdog found that the revised plan to demolish and rebuild the headquarters in Washington could be more expensive than initial plans to relocate the agency. 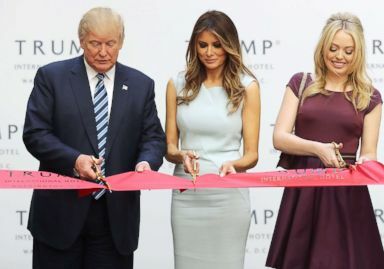 File photo of then Republican presidential nominee Donald Trump, left, his wife Melania Trump and daughter Tiffany Trump cutting the ribbon at the new Trump International Hotel on Oct. 26, 2016, in Washington. The Trump Organization had arranged to lease the Old Post Office building from the federal government prior to Trump’s bid for the White House, and the GSA is now the landlord of the Trump International Hotel in Washington, which is located just blocks away from the FBI’s J. Edgar Hoover Building.